For the first 17 years of their existence, the Denver Broncos had been perennial also-rans. It had taken them from 1960 until 1973 just to post a winning record, and they had not yet appeared in the postseason. That all ended in 1977 in their first year under Head Coach Red Miller. The team featured the “Orange Crush” defense that included DE Lyle Alzado, linebackers Randy Gradishar and Tom Jackson, CB Louis Wright, and SS Bill Thompson. The offense was conservative but took advantage of opportunities and kept mistakes to a minimum. 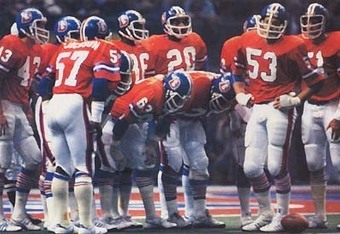 QB Craig Morton (pictured at right), a 34-year-old veteran who had been obtained from the Giants, revived his career in Denver. The Broncos won the AFC West with a 12-2 record and defeated Pittsburgh in the Divisional playoff round. On January 1, 1978 the upstart Broncos hosted the Oakland Raiders for the AFC Championship. The defending NFL Champions were used to winning under Head Coach John Madden and had finished atop the AFC West in all but one season since the AFL/NFL merger in 1970 and prior to ’77. Losing decisively to the Broncos at Oakland in Week 5 had been a key event in Denver’s ascent, but the Raiders had returned the favor two weeks later with a 24-14 win in the rematch (indeed, the Raiders had not lost in Denver since 1962, although the clubs tied twice). QB Ken “the Snake” Stabler was not as outstanding as in ’76, but could not be taken lightly in a big game and still had outstanding targets in wide receivers Fred Biletnikoff and Cliff Branch and TE Dave Casper. FB Mark van Eeghen paced the ground game with 1273 yards. The defense might also have lost a bit, especially with an early season-ending injury to LB Phil Villapiano, but it was still a tough and seasoned outfit. Oakland went 11-3 in securing a wild card slot in the postseason and beat the Colts the previous week in an overtime thriller at Baltimore. Mile High Stadium was largely a sea of orange with 74,982 in attendance. The Raiders scored first with a 54-yard drive in the opening period that ended with Errol Mann kicking a 20-yard field goal. Denver responded quickly as Morton connected with WR Haven Moses for a 74-yard touchdown on a second-and-15 play. 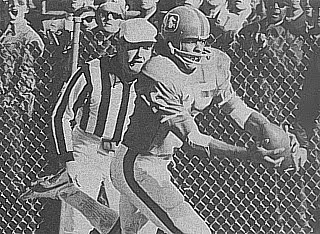 The fleet wide receiver eluded SS Skip Thomas on the way to the end zone. There was no further scoring in the first half. Mann missed a 30-yard field goal attempt that hit the right upright and Jim Turner was wide to the left on a 40-yard attempt for the Broncos. In addition, the Raiders lost Biletnikoff to a dislocated shoulder. The score remained 7-3. Early in the third quarter, the Broncos had another scoring opportunity as Moses caught a pass for a 41-yard gain, but Turner again missed a field goal attempt, from 31 yards after a bad snap. However, on the next play Raiders HB Clarence Davis fumbled a handoff and Denver DE Brison Manor recovered at the Oakland 17. Following a short carry by FB Jon Keyworth and a 13-yard Morton pass to TE Riley Odoms, Denver was at the two yard line and on first-and-goal, HB Rob Lytle dove over the top and was hit by FS Jack Tatum, with the ball squirting loose. Raiders NT Mike McCoy recovered and the Oakland players began celebrating, but the officials (chiefly head linesman Ed Marion) ruled that Lytle’s forward progress had been stopped prior to the fumble and it was still Denver’s ball (moved to the one after a vehement protest by LB Floyd Rice resulted in an unsportsmanlike conduct penalty). FB Jon Keyworth took a pitchout on the next play and ran in for the touchdown and a 14-3 lead. The Raiders were far from dead and, late in the third quarter, they drove 48 yards in a series that extended into the fourth quarter. Stabler threw to Casper who spun into the end zone in front of LB Joe Rizzo for a seven-yard TD. Denver responded with a long drive, but Rice intercepted for the Raiders at the Oakland 11 and returned it to the 22. Possession changed again when Denver LB Bob Swenson picked Stabler off at the 31 and returned it to the Oakland 17. Two plays later, Morton threw to Moses, who made a sliding catch in the end zone for a 12-yard touchdown. Although Turner missed the extra point, it was still a 20-10 lead for the Broncos. Oakland moved the ball effectively once more, with Stabler throwing short passes. An eight-play, 74-yard drive ended with Casper catching another TD pass, leaping to pull it down in the back of the end zone. It was a three-point game with 3:16 remaining, but the Broncos were able to run out the clock and win by a score of 20-17. The jubilant crowd tore down the goal posts and celebrated long afterward. The statistics reflected the closeness of the score as Denver outgained the Raiders by ten yards (308 to 298) while Oakland had the edge in first downs (20 to 16). Both clubs had difficulty running the ball against the other (the Raiders gained 94 yards on 36 carries and Denver had 91 on 37 attempts). Oakland suffered three turnovers, to one by the Broncos, although Denver had more penalties (8, at a cost of 46 yards, to just two, for six yards, on the Raiders). The Broncos typically capitalized on scoring opportunities during the season, but had difficulty against Oakland. 14th-year veteran Jim Turner missed three field goal attempts (from 40, 31, and 44 yards) and an extra point and Denver’s one turnover was a Morton interception in the red zone. Meanwhile, Oakland had won the previous meeting by running effectively behind OT Art Shell, but Denver’s swarming defense played aggressively and was able to neutralize the ground game. Craig Morton was successful on 10 of 20 passes, compiling 224 yards with two touchdowns against the one interception. Haven Moses (pictured below) had a spectacular performance with 5 catches for 168 yards and two scores. FB Lonnie Perrin was the team’s leading rusher with 42 yards on 11 carries. For Oakland, Ken Stabler completed 17 of 35 throws for 215 yards with two TDs and one picked off. Dave Casper pulled in 5 receptions for 71 yards and the two fourth-quarter touchdowns. Mark van Eeghen rushed for 71 yards on 20 attempts. The Cinderella drive to the Super Bowl ended for the Broncos with a 27-10 beating at the hands of the Dallas Cowboys. Denver would come back to win the AFC West in 1978, but didn’t make it past the Divisional round in the postseason. Oakland missed the playoffs in 1978 and ’79 with back-to-back 9-7 records, but bounced back to win the Super Bowl in 1980.